Access to webinar recordings with CPE and Slides included. * Your receipt will contain your access information. You will need to be logged into your account to view the recording. This NLFN product can only be purchased by members. To purchase this product, sign up by purchasing NLFN Membership - Tier 3 - Platinum, NLFN Membership - Tier 2 - Gold or NLFN Membership - Tier 1 - Emerald. Has this been enough? Considering 70% of the variability in bone mass in humans is associated with multiple genes across different biological systems, it’s time that recommendations become more specific and better matched to each individual. 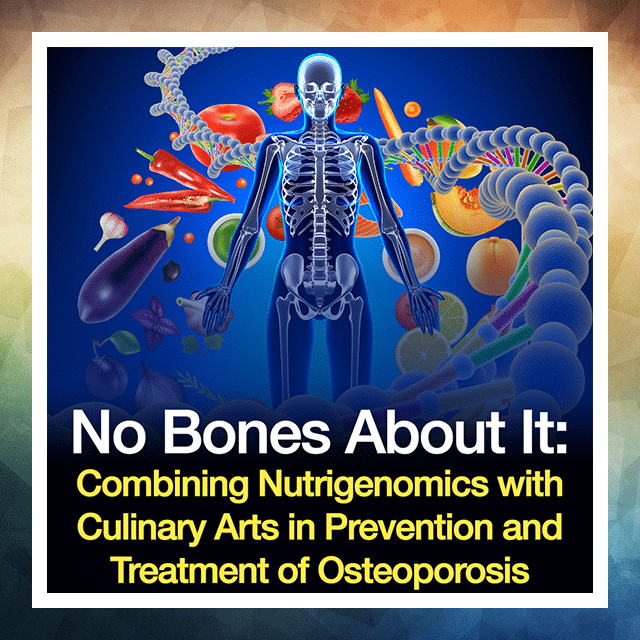 This presentation highlights how genotype impacts risk for osteopenia/osteoporosis by identifying polygenic single nucleotide polymorphisms (SNPs) associated with reduced bone mass, detailing how nutrigenomic and culinary interventions can mitigate their effects, and how assessing specific biomarkers can lead to better health outcomes for this at-risk population. A case history will demonstrate the value-added using genomic SNP identification and bio-marker indices leading to personalized dietary, supplement, and lifestyle recommendations, including a detailed explanation of specific culinary considerations related to nutrigenomics, and include a road-map, translating nutrient intervention into actionable recipes and meal concepts. Describe the function of genes involved in bone formation/degradation and explain how gene SNPs associated with osteogenesis impact biochemical and metabolic pathways leading to a loss of bone mass. Recognize how gene variants in bone formation and bone degradation, nutrient utilization, inflammation and exercise can alter bone mass and lead to osteopenia or osteoporosis.